Last month, we had lots of great new releases such as Digium’s A-series IP phones and Grandstream’s GVC3200 video conferencing unit. 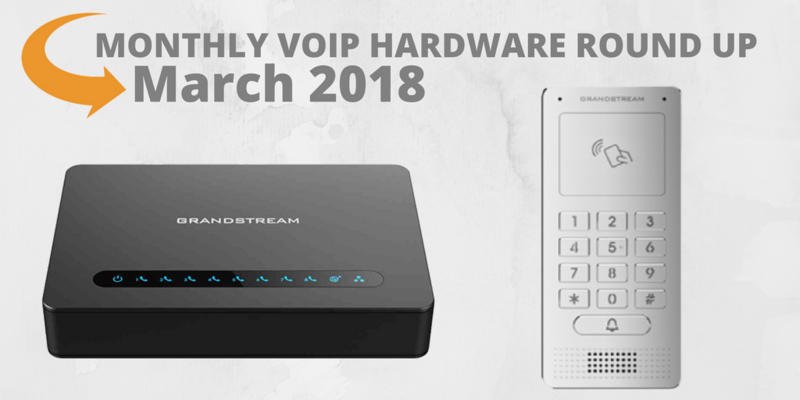 This month, we are seeing more exciting new VoIP hardware that will take your unified communication system to a higher level. Let’s check it out! The HT818 is an 8-port FXS gateway that facilitates the conversion of analog lines to VoIP. With an integrated Gigabit NAT Router and strong encryption, the HT818 is a reliable and safe gateway/router for VoIP deployments. If you are looking for a quick way to add analog ports to your SIP-based phone system, the HT818 can be a perfect fit! The GDS3705 is an entry-control VoIP system that provides a secure and rugged touchless entry system. This device comes with a built-in RFID card reader and can be easily managed through the IP network. The built-in microphone can pick up noises/voices up to 1.5 miles away! Managed through the IP Network giving users the ability to easily check alarms, add/remove users, change setting, etc. The 2900e PoE is ideally suited for Hosted PBX applications that require POE functionality to power IP endpoints. This solution enables service providers to easily support locations with less than 12 phones with a single device. Simply combine the 2900e with the EdgeView Service Control Center to remotely monitor and manage your VoIP phone system anywhere anytime! Yealink’s Teams Edition IP Phones Are Now Available!